All Persons Rotary Park is ideal for families with both young and older children in the Brandon area. The long and wide playground offers excellent shading by the mossy oak trees. There are two playgrounds, one for 2-5 yr old’s and one for older children. The ground is made of cork style tire rubber flooring which makes it disabled-friendly. A large pavilion that can be used for a family picnic or rented for a birthday party. There is ample seating surrounding the playground where parents can rest and watch the kids play. The kids can cool down at the water fountain pad. There are not any interactive features, but the little ones will still have fun splashing and playing in the water. There’s also a baseball field and court on on the other side of the playground. 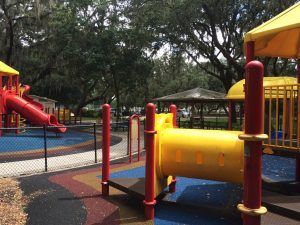 All Person’s Park is a fun park to visit in the Brandon area.